Digital home brewing is the way of the future and Blichmann is making their way in to the marketplace with yet another fantastic home brewing item. Introducing the Blichmann BrewVison! The Blichmann BrewVision wireless home brewing monitoring system is the new brewing assistant from Blichmann Engineering. The BrewVision allows you to track up to 7 sensors in your home brewing setup right from your iphone or ipad. Brew Vision lets you can set alarms and timers based on temperatures and the BrewVision app records all of your data so you can review to see how well you really hit those mash temps. The BrewVision homebrew monitoring system even integrates with BeerSmith home brewing software which allows you to download your recipes straight from the cloud. The intuitive BrewVision Home Brewing Monitoring app helps you focus on your brewing! Some of the functions of BrewVision include monitoring thermometers on a kettle, running timers, viewing recipe information. Blichmann’s BrewVision puts temperature information, timers, and recipe information into the palm of your hand and provides a fully interactive digital home brew session. The Blichmann Brew Vision home brewing monitoring systems uses bluetooth technology to help you do more and and put the power of BrewVision in the palms of your hands! The BrewVison has an indoor range of about 25 feet and up to 100 feet line of sight range. It is also super accurate with a +/- 0.5F accuracy range, so you cab be confident your mash and sparge are on target! Blichmann has thought about everything with the BrewVision digital home brewing system. The battery life on this device is 100+ hours using 2 AAA batteries. That means that you can brew about 20 all grain home brewing batches and about 40 extract batches on just one set of batteries. 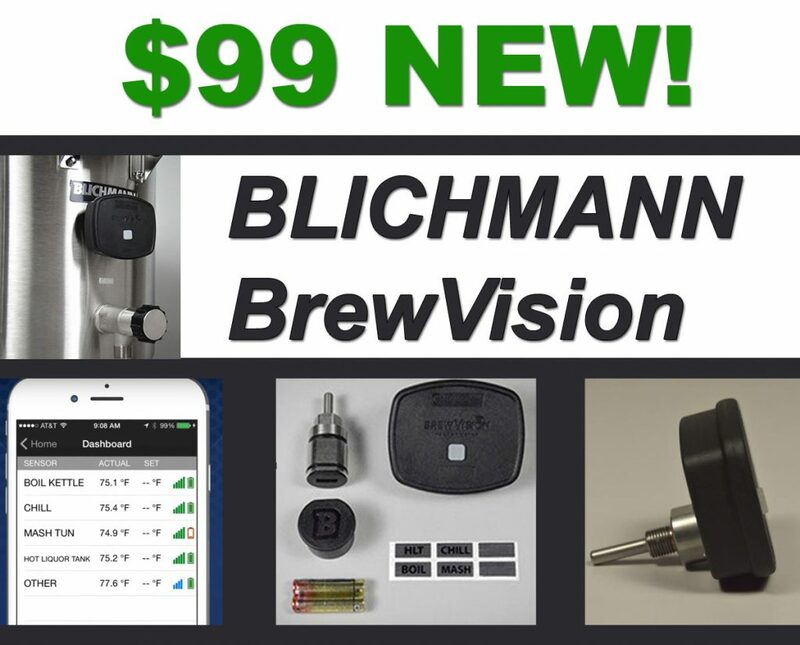 Click the link for additional information or to purchase a Blichmann BrewVision! This item ships free!